“While the war is over, the conflict is alive and well …” Bishop Donal McKeown of Derry warned on Tuesday at a memorial service for those who died in the 1982 explosion at the Droppin’ Well disco, Ballykelly, Co Derry. Acknowledging that it is important to remember those whose lives and life chances were snuffed out by the brutality of others, Dr McKeown added that any Christian religious service can never be about “promoting a selective, myopic recalling of the past, allowing ourselves to be used to serve other current political or personal agendas”. He said how we remember events is a significant factor in how we help our younger people envision the future. “In our still contested political space, commemorations like this can be not so much sentimental as seminal,” the bishop said. He told those attending the memorial that the stories that we tell about the past in this country “have tended to be characterised by tales of victimhood and heroic resistance”. He also asked if a narrative about Ballykelly could be avoided that would make it an excuse for some to visit violence on others? 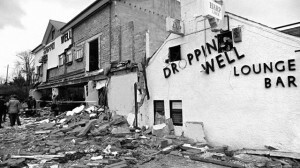 He said he doubted that the 17 people killed in the Droppin’ Well would want to be recalled in a way that perpetuates hatred or bitterness. “That would mean that neither they nor we could be at peace,” Bishop McKeown suggested. While the war is over, the conflict is alive and well he observed but added that because of the victory of Jesus we do not need to be victorious, only to speak the truth for it is that alone that will set us free.